Flourishing in front of a maths, science and fiction backdrop, Nashville-based duo Wild Ponies brought an alternative slice of independent Americana to Thimblemill Library on another successful venture of taking meaningful music into the heart of our urban communities. Doug and Telisha Williams have become widely praised perennial UK visitors since their first trip with Rod Picott a couple of years ago and this inaugural visit deep into the core of the industrial West Midlands saw their flame burn brighter with a new band of admirers secured. 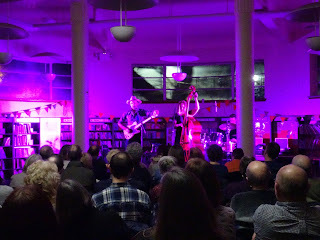 For the handful of existing Wild Ponies fans attending, it was business as usual in terms of music, songs and engaging anecdotes, but the true worth of the evening was the rapturous reception given by their new fans among a gathering that edged into three figures. Clad in his grandfather’s stylish hat and armed with dual guitar weaponry, including the trusty Telecaster, Doug thrived in this opportunity to share his skills, values and passion for a commendable outlook on how music can reflect the subtleties of life. 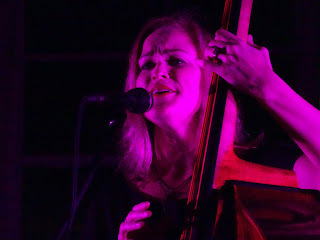 Telisha displayed the precious virtues of grace and a southern charm alongside her familiar upright bass and irresistible vocals which wrap each song in a sassy cover. As per recent tours, they have acquired the services of Tobias Humble on drums to provide that essential third rhythmic dimension especially when the throttle is turned up. For two hours, intersected by a short break, we were treated to songs from three sources: both recent albums credited to the Wild Ponies and a surprising insight to a new exciting project. This last point is founded on the theory that the ink is barely dry on their latest album RADIANT which has only surfaced on both sides of the pond since midway through last year. However creative drive knows no constraints and we were introduced to three new songs that herald the next phase of the Wild Ponies. More on this will follow as the year pans out, but for a little taster think purity, isolation, connection and that frozen in time pin drop moment. Throw in accomplices such as Will Kimbrough and Amelia Curran to add to the anticipation. Since the Wild Ponies last visited the general Midlands area (they are regular visitors to the Staffordshire village of Elford), the RADIANT album has become widely available and this evening’s show opened with four tracks from that record. When ‘Love is Not a Sin’ was first heard it was surrounded by the joy of a Supreme Court ruling in the US; tonight its airing was in a far more resolute tone in light of fearful new developments. Overall this album continues to flourish whether in the optimism of the title track and its co-write origins; the classic slow dance vibes to the ‘Night We Never Met’ and the raucous set closing rampant ode to re-connecting with things that matter in ‘Unplug the Machine’. Ok you’re plugged in now, but for three important minutes at every Wild Ponies show nobody is, including a hundred people in Smethwick on this Saturday evening. Who can resist a murder ballad? Wild Ponies can’t with ‘Trigger’ and ‘Lullaby’ both bringing some gore to the proceedings. For a take on nostalgia, ‘Things That Used to Shine’ fits the bill, while in the name of NASCAR history, ‘Massey’s Run’ adds some vibrancy to the pace. ‘Broken’ was another of the upbeat songs to make the set list and a super trait surrounding the Wild Ponies is their versatile adeptness at contrasting song tempos. Perhaps the most poignant moment of the show was Telisha opening up about personal issues leading into a resounding version of ‘Make You Mine’. To enhance this incredibly high value-for-money show, the organisers booked the services of local band The Lost Notes as support and allotted forty minutes for them to share a bunch of self-penned songs defined by multi-part harmonies and a successful desire to entertain. Though appearing in a slimmed down three person format from their usual five, the performance was well-received and acted as the perfect opening tonic to set the scene for the Wild Ponies. In these times when promoting ‘below the radar’ music can be a tough process, not from the quality of the artist but a general apathy to crawl from under the corporate blanket, this show was a refreshing achievement. There is a growing band of devoted folks across the UK ready to believe in the Wild Ponies and the reception when presented in front of new audiences is guaranteed to be positive. For one night, this buoyant and thriving essential local community venue threw open its doors to welcome a small part of independent East Tennessee. There is hope after all.